As plans start to take shape, the excitement of vacation sets in. 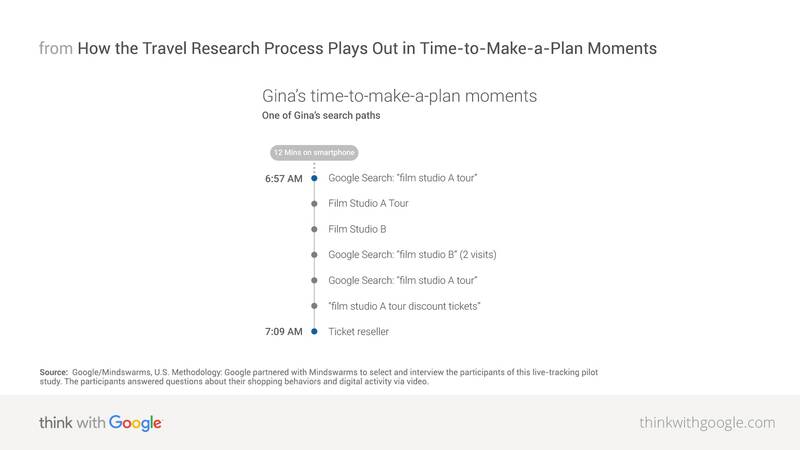 Part three of this six-part series on travel micro-moments dives into time-to-make-a-plan moments—the planning moments that happen after a destination is chosen—and how travel marketers can capitalize on these key decision moments. Once someone chooses a travel destination, the dreaming starts to become reality. 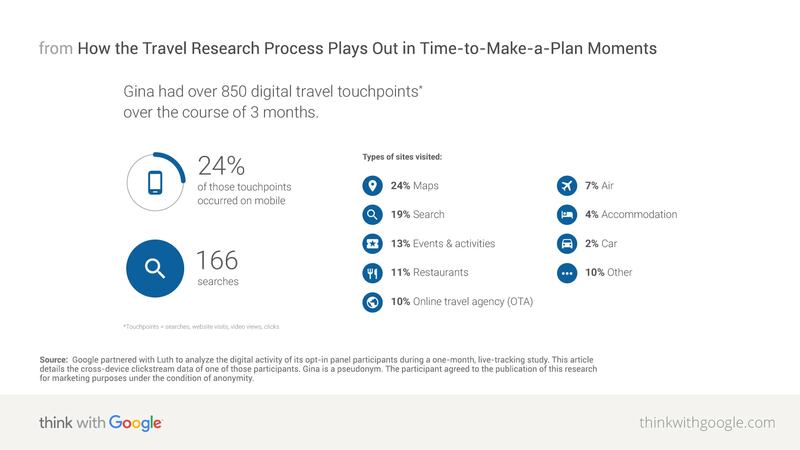 Enter: time-to-make-a-plan moments, when people turn to a device, setting the wheels in motion for the travel research process. Leisure travelers today are as likely to shop for flights on their smartphones as they are to shop for music. If you aren't already in the consideration set at this point in the customer journey, these time-to-make-a-plan moments are your opportunity. Online interactions are increasingly shaping how people make a plan for their next trip. New clickstream data from Luth Research's opt-in panel (illustrating the pages a user visited, and in which order) provides a snapshot of what a real traveler's time-to-make-a-plan moments actually looked like. By analyzing this traveler's searches, clicks, website visits, and video views while she was in planning mode for her upcoming travel, we can start to see exactly how and how much digital played a role in influencing her destinations. Meet Gina. Gina is a middle-aged woman from Nevada, traveling to San Diego for a mothers' conference. Her visit is both business and pleasure, and she's looking for fun things to do with her child while in Southern California. Source: Google partnered with Luth to analyze the digital activity of its opt-in panel participants during a one-month, live-tracking study. This article details the cross-device clickstream data of one of those participants. Gina is a pseudonym. The participant agreed to the publication of this research for marketing purposes under the condition of anonymity. As you can see, time-to-make-a-plan moments are crucial for marketers to win. And even though these moments might seem fleeting, there are a few concrete ways to ensure your brand is there and useful at this point in the customer journey. Show up when people research the specifics for a destination. During the planning phase, travelers say that search is the most common way in which they discover the brand they ultimately book with.1 Common searches in time-to-make-a-plan moments include "hotels in [destination]," "car rentals in [destination]," and "flights to [destination]." Plan for these moments happening on mobile. Consider this: 70% of travelers with smartphones have done travel research on their smartphone. In fact, you may be surprised by the fact that nearly 50% of Google Flights visitors are on a mobile device.5 And leisure travelers today are as likely to shop for flights on their smartphones as they are to shop for music.6 With this in mind, we've made sure Google Flights displays current information and connects shoppers to airline partners in a mobile-friendly way. We've designed how hotel search results appear on Google to help travelers easily pinpoint the right hotel, using filters on mobile for things like amenities, which in turn creates more qualified customers for brands. La Quinta's mobile traffic has doubled in the last three years; today 33% of its online visitors come from mobile devices. During peak season last year, La Quinta decided to turn on mobile Google Hotel Ads to connect to more consumers in their planning moments and to increase qualified leads. This drove traffic to its updated mobile site to meet the growing number of travelers who were looking for hotels on the go. The results were strong. "Hotel Ads are performing at a significantly stronger conversion rate; twice what we see for regular traffic on mobile," says Ted Schweitzer, SVP of marketing and e-commerce for La Quinta Inns & Suites. "And that makes a big difference in terms of results." There's a lot more to learn. Check out this more detailed feature on La Quinta's approach to time-to-make-a-plan moments, including a video complete with interviews from the people driving this thinking for the brand. Another great example to note is Etihad, the national airline of the United Arab Emirates. The company helps consumers make more informed decisions by using current flight data in search and display ads. Its customers tend to be busy travelers of the world. Etihad realized that the best way to be useful to these customers was to give them information up front to inform their booking decision. Etihad used its own data from Google Flights to populate display and search ads dynamically, with up-to-date data on flight schedules and prices. The new information lowered the airline's click-through rate by removing unqualified leads, increased its conversion rates by 2X, and decreased its CPA by 70%. Etihad delivered just what people needed in their time-to-make-a-plan moments, and that won the brand more qualified customers at a lower cost. That's a مكسب للجميع—a win-win. 1 Google/TNS, global travel survey, U.S., Apr. 2016. 2 Google/Ipsos Connect, travel playbook omnibus, n=976, among U.S. travelers 18+ who use a smartphone and for whom the statement is applicable, Apr. 2016. 3 Google/Ipsos Connect, travel playbook omnibus, n=405, among U.S. travelers ages 18-34 who use a smartphone and for whom the statement is applicable, Apr. 2016. 4 Google/Ipsos Connect, travel playbook omnibus, U.S., n=1664, among U.S. travelers 18+, Apr. 2016. 5 Google Flights Data, U.S., mobile devices including both smartphones and tablets, Apr. 2016. 6 Google/Phocuswright, leisure traveler study, base: U.S. leisure travelers, n=930, Oct. 2015. 7 Google Data, U.S., Mar. 2016.